Join Groundlings Theatre Company in celebrating the bicentenary of Portsmouth’s greatest literary figure. The Groundlings Theatre is the very place where Charles Dickens’s story begins, as Elizabeth Dickens went into labour with her famous son while attending a dance here, so it is fitting that we recognise our building’s unique link to one of the world’s greatest writers with a host of events for the whole family. The Theatre will be transformed into a living museum featuring characters from Dickens’s novels, workshops will give young people the chance to see what being a child in Victorian Portsmouth was like, and that fateful ball will be recreated, ending with a torchlit carriage procession from the theatre to Dicken’s birthplace. Dickens Living Museum Tours will happen hourly from 10am - 4pm. Tickets £3. Victorious Victorians will take place on 31 January 10am. Tickets £3.50 (teachers go free). There will be a Victorian Childhood Workshop on 1 and 2 February 10am – 1pm. Tickets £3. Twisted Expectations - Dickens Murder Mystery Dinner will take place on Saturday 4 February at 8pm. Tickets including two course meal £18. 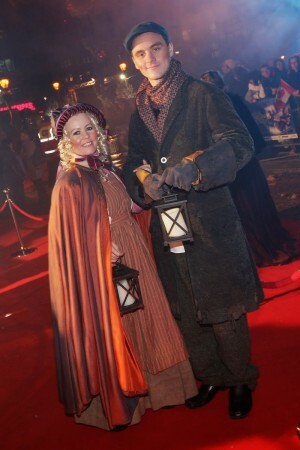 Meet a parade of Dickensian characters in a Murder Mystery Dinner specially written for Dickens 2012. Enjoy “food glorious food” and 'pickwick' the brains of the cast to solve a terrible murder in Victorian London. Dickens Ball. Break out your ball gowns, iron your cravats and join us in a unique recreation of the 1812 ball that marked the birth of Portsmouth’s literary genius. Glide around our ballroom with Dickensian dancers and let our live music transport you back in time. Monday 6 February from 8pm. Tickets £12 / £10 Concessions. Box Office 023 9273 7370 info@groundlings.co.uk. For costume Hire 023 9273 7370 wardrobe@groundlings.co.uk.